(Thursday 1:45 p.m.) - Heavy rainfall overnight caused isolated flooding in various parts of Western North Carolina, and a tropical storm warning remains in effect for at least the rest of Thursday in Asheville and Weaverville. The National Weather Service says winds could gust up to 45 miles per hour in Asheville and Weaverville on Thursday, causing the potential for property damage or worse. A flash flood warning is in effect until 3:30 p.m. for southeastern Buncombe County, eastern Henderson County, and western Polk County. A river flood warning is also in effect until tomorrow for the Swannanoa River in Biltmore Village. The river was near it's 10-foot flood stage around noon Thursday, and was forecast to crest at 11 feet later in the afternoon according to the U.S. Geological Survey. That would cause minor flooding in an area that saw its worst flooding in 14 years in late May. Portions of Azalea Road and Swannanoa River Road were closed Thursday. A separate river flood warning is in effect for the French Broad River in Fletcher. It's expected to crest at 14-feet - one foot above its flood stage - late Thursday evening. That would cause flooding on Banner Farm and Glenn Bridge Roads. Flooding was also affecting multiple areas in McDowell County, which saw significant damages and landslides in late May after heavy rains. 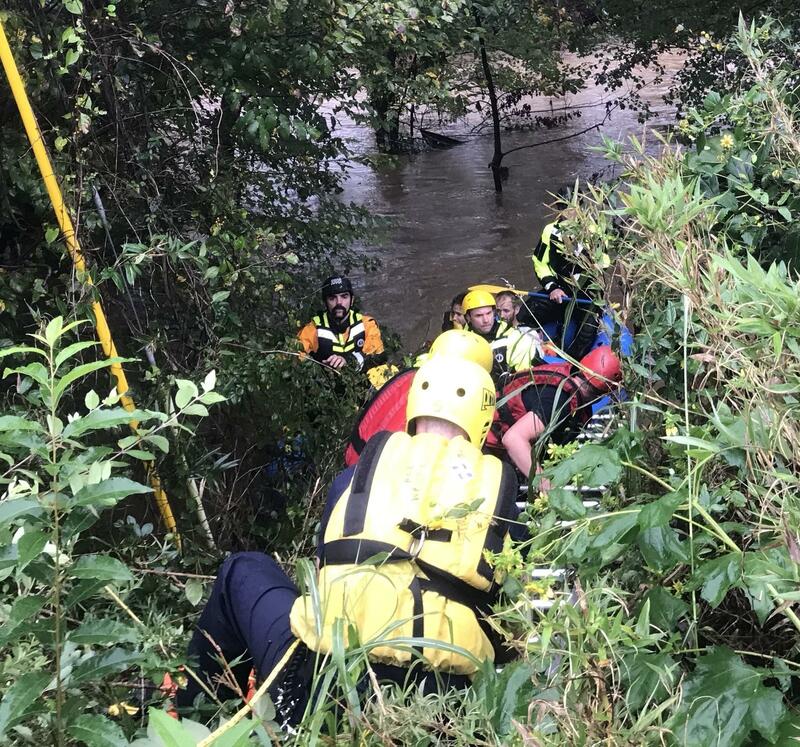 The Asheville Fire Department did rescue two people who were stuck in a hammock off of Swannanoa River Road around 10 a.m. Thursday. According to the department's Twitter feed, a rescue boat was used to secure the pair. 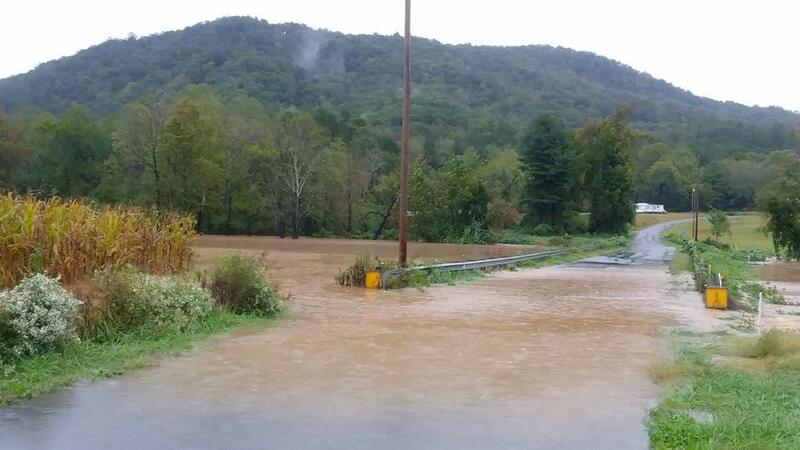 In Henderson County, flash flooding prompted authorities to open an emergency shelter at East Henderson High School. That shelter will stay open until flood waters recede. Buncombe County schools sent students home this morning in the Owen District because of the possibility of power outages and flooding. Henderson and Yancey Counties schools are allowing students whose parents can pick them up at any time. Both school systems say conditions late this morning were unsafe for buses to run to allow for a general early dismissal, so kids who cannot be picked up will be held at school until buses can run again this afternoon. (Wednesday 5:30 p.m.) Hurricane Michael is expected to hit North Carolina Thursday, a state still reeling from the destruction and flooding caused by Hurricane Florence last month. But just like that storm, Western North Carolina will miss the brunt of Michael. The track of Hurricane Michael Wednesday afternoon showed it going through central and northeastern North Carolina on Thursday. Even though it will not come to the western part of the state, the region is still seeing rainfall on Wednesday and Thursday that prompted the National Weather Service to issue a flash flood watch. That watch is in effect until 8 p.m. Thursday evening for Buncombe, Henderson, Transylvania, and Yancey Counties, as well as the eastern parts of McDowell and Polk Counties. The National Weather Service says anywhere from 2 to 5 inches of rain could fall on the eastern slopes of the Blue Ridge Mountains and foothills, which could cause flash flooding and landslides.